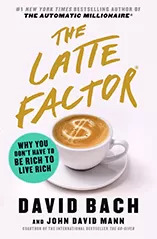 I’m turning 36 in May and unfortunately do not have much stored away for savings (okay, none) I read both Start Late, Finish Rich, and then Automatic Millionaire and decided to take control of my financial life and start automating my savings. I don’t have too much debt (only $3000 in credit cards) which I’m paying off at least $500 a month. But in a twist on the Latte Factor, that credit card is a Starbucks card. So keeping all my necessary payments (phone bills, groceries, etc.) I can get credit towards Starbucks. So I can have my latte and drink it too by paying off the credit card bills immediately.